Silicon Valley lies in the South Bay and the southern Peninsula of the San Francisco Bay Area. Once best known for its prune orchards, the area underwent explosive growth with the creation of the high-tech electronics industry in the 1960s. Although much of the area is a bustling 21st-century cyber-living, which is typical of most major cities in the United States, it still is a relatively short distance from many of the beautiful natural scenic vistas. The term “Silicon Valley”, was first used by Don C. Hoefler, publisher of Microelectronics News, in his article titled “Silicon Valley USA” on January 11, 1971. Since then the term has become synonymous with the center of high technology research and development. “Silicon” refers to the high concentration of semiconductor and computer-related industries in the area at the time. “Valley” refers to the Santa Clara Valley. Silicon Valley is the southern portion of the San Francisco Bay Area, also known as, South Bay, which covers cities such as San Jose, Santa Clara, Cupertino, Sunnyvale, and Los Gatos. Today, the region has extended beyond the greater Santa Clara Valley which includes the entire Santa Clara county and parts of San Mateo, Alameda, and Santa Cruz counties in northern California. While there are hi-tech companies all along the west coast — from Canada down to Mexico — and many in various parts of California, the main cluster is in Silicon Valley. So if you’re looking to visit the Silicon Valley as a tourist, look to Palo Alto, Santa Clara, and the museums in San Jose metro area. Seeing the headquarters of so many legendary high-tech companies and venture capital firms in one place is kind of fun, especially for techno-geeks. 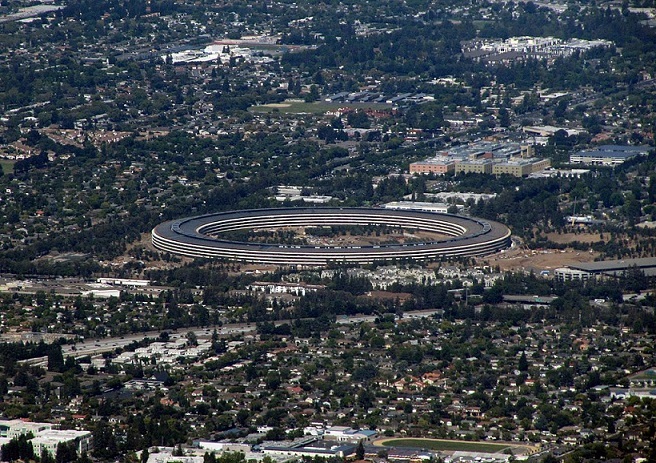 But the novelty wears off after a few hours, and visitors should better stick to the campuses of big tech companies, such as, Google (Mountain View), Apple (Cupertino), and Facebook (Menlo Park in the Peninsula, a few miles north of downtown Palo Alto). The only major Silicon Valley company that openly caters to tourists is Intel, which has a free small museum at its Santa Clara headquarters dedicated to its semiconductor business. At a lesser degree, Google has fun Android statues on-campus specifically aimed at visitors, and its colorful bikes and propeller hats are otherwise worth the trip. Apple operates a Visitor Center next to its brand new Apple Park headquarters—a colossal circular building which is by itself like no other—with an augmented reality model of the site and a balcony overlooking it. HP Garage is considered as the birthplace of the world’s first high-technology region, “Silicon Valley.”. The “HP Garage” was designated California Historical Landmark No. 976 in 1989. Other major points of interest include the Tech Museum of Innovation in San Jose and the Computer History Museum in Mountain View. Stanford University is located just south of Palo Alto. Stanford Industrial Park was renamed Stanford Research Park in 1974. Stanford Research Park is considered by many the foundation of Silicon Valley. By 2005, Stanford Research Park was home to more than 150 companies in electronics, software, biotechnology, as well a number of top law firms, financial service firms, consultancies, and venture capital companies. R&D and service companies occupied some 10 million square feet in more than 160 buildings on 704 acres. William Shockley was a Bell Labs physicist and one of a group there who got a Nobel Prize for inventing the transistor. In 1956 he opened his own electronics company in Mountain View, the area he had grown up in. Only a year later, some of his young engineers (the “traitorous eight”) left to found Fairchild Semiconductor in San Jose. Fairchild was the first company to use silicon rather than germanium for its transistors and the first to succeed in producing integrated circuits commercially. Like the other major players of the era — Texas Instruments and Motorola — Fairchild Semiconductor was a branch of a large firm well established in other areas of electronics. Two of the “traitorous eight” who founded Fairchild Semi later started Intel in Sunnyvale. Other “Fairchildren” companies include AMD (in Sunnyvale), National Semiconductor (Santa Clara), and Intersil (Milpitas). Many of Silicon Valley’s best-known companies were started by “the Fairchildren”, people who learned their trade at Fairchild then left to try their own ventures. This started a trend which continues to this day. By one estimate, there are about 400 such companies. Uber and Lyft is your next best option for short distance. After all, you are in the Silicon Valley. It’s quite possible to see Santa Clara and San Jose area by public transport and walking. San Jose Airport is connected to the local light rail by a free shuttle bus, or you can get one of the scheduled bus services that service the airport as well. Taxis and ride share is another way to get here from the airport. San Jose Airport connects to Caltrain by VTA bus line 10, a free shuttle between the airport and the Santa Clara Caltrain station and transit center. Various other local VTA bus lines also leave from this transit center. From the San Francisco International Airport (SFO) use the BART connection to Caltrain and take Caltrain south. Note that the two train systems require separate tickets.